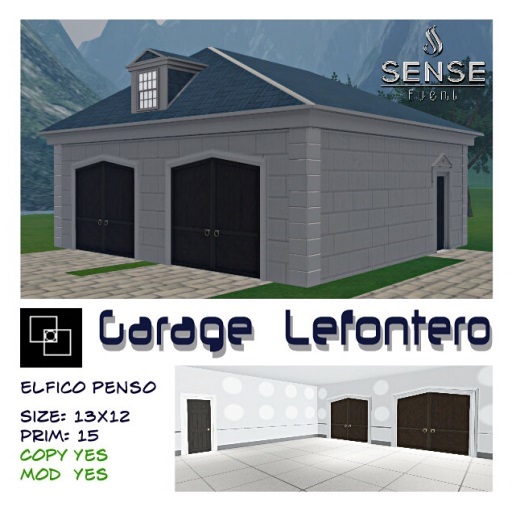 Elfico Penso is at the Sense Event with the Mansion Lefontero Prefab with matching Garage build. And a Mansion it is! Impressive the moment you walk into the door, flanked with two wall niches with a vase in it, and walk into the entrance with the stairs with red carpet being the most prominent feature. There's two rooms at either side, with richly ornamented floors and walls. The upstairs gives access to 5 connected rooms and a small balcony. This has all the potential of becoming a great, luxurious family home. Every room is textured different, but they are all done with massive amounts of richly decorated textures. Land Impact on the Mansion is 189 at a 26x18 footprint. Permissions are Modify & Copy. Added on to the building is a matching Garage. Room to park that extravagant Sports car! It comes at 15 Land Impact at a 13x12 m footprint. Permissions are Modify & Copy.